The 2014 Fiat 500c GQ Edition is part of a collaborative effort at automotive design between Fiat and Conde Nast, which owns Gentleman's Quarterly magazine. It's a "lifestyle" car meant to appeal to wannabe GQ types with the GQ Edition Conquecento featuring custom appointments to emphasize its appeal to the GQ man. This new cabrio model is tailored with athleticism and style-consciousness, incorporating the performance of the Abarth's 1.4-liter MultiAir® Turbo engine, a sharply tailored appearance, and interior refinements. The front fascia is more pronounced, with larger intakes to maximize airflow, while performance-styled side sills give a more athletic profile. New 16-inch five-spoke aluminum wheels have been added and finished in Hyper Nero with a Rosso center cap. The cloth-top mounted spoiler finishes the roofline while a rear diffiuser integrates with the dual exhaust system. Gloss Nero is used on the headlamp, tail lamp, and parking lamp bezels and a "GQ 500" badge is added to the B-pillar. The power-operated cloth top retracts to that rear spoiler and can be operated at speeds up to 60 mph and the top can be stopped at any point, allowing the opening to be as large or small as the passengers prefer. At speeds up to 50 mph, the top can be retracted even further, to tuck behind the rear headrests. This reveals the interior refinements mentioned, with the 500c GQ Edition sporting unique color treatments including a thick-rim three-spoke steering wheel wrapped in Nero leather and Steam inner leather ring. The instrument cluster is slightly larger and is wrapped in a Nero leather brow with Tungsten accent stitching. The same bespokes the shift knob. GQ Edition-specific satin chrome interior accents finish the interior's upscale look. Other additions to the 2014 Fiat 500c GQ Edition include specially-designed sport seating and exclusive body colors that include Nero Puro (black), Argento (silver), Granito Lucente (granite crystal) and Bianco (white). 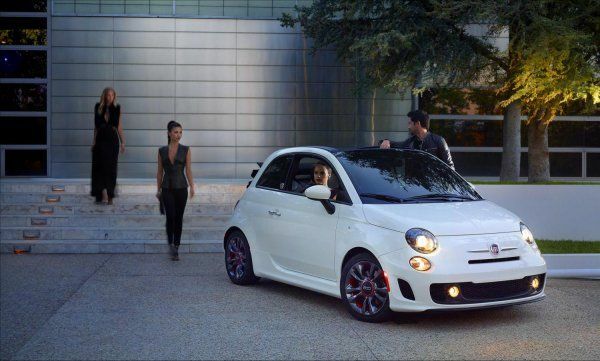 The 2014 Fiat 500c GQ Edition will enter select showrooms in early 2014.